The Cleveland Cavaliers still find themselves in a big hole in the NBA Finals, down 2-1 against a Golden State Warriors team that is not likely to lose three out of the next four games. But if there is something the Cavs can hang their hat on it is that LeBron James looks a lot like the LeBron James who led the Miami Heat to back-to-back championships. Earlier, Scott Davis took a look at how the Cavs were conservative with LeBron’s playing time this season. That seems to be paying off big time as James seems to have more explosiveness from his legs in the playoffs. But we can also see it in the numbers. 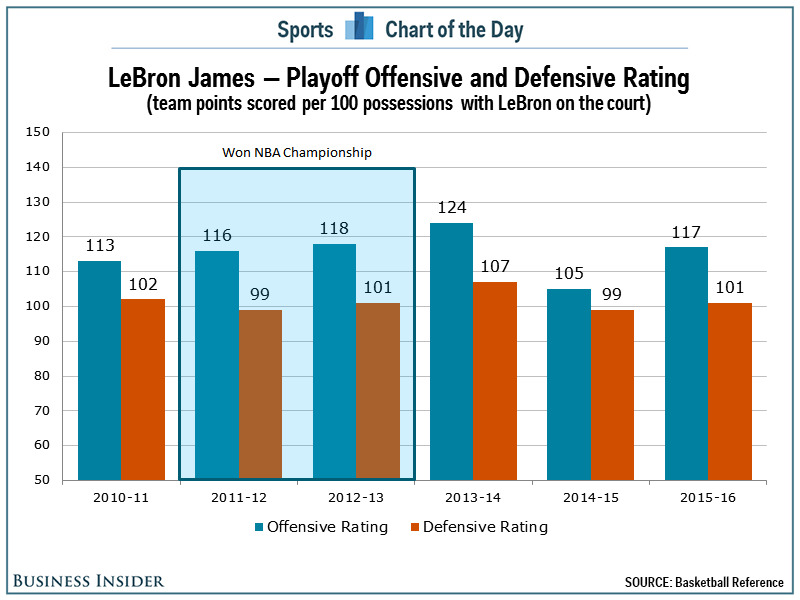 If we look at the points the Cavs are scoring (offensive rating) and giving up (defensive rating) per 100 possessions in the postseason when LeBron is on the court, this year’s numbers (117 and 101) look a lot like the 2012 and 2013 playoffs for the Heat and a lot better, offensively at least, than what the Cavs did a year ago (105 and 99). None of this means the Cavs are winning a title this year. But it is promising for the Cavs that LeBron is playing better in his second season and that last year may have just been an adjustment period, not the start of a decline.